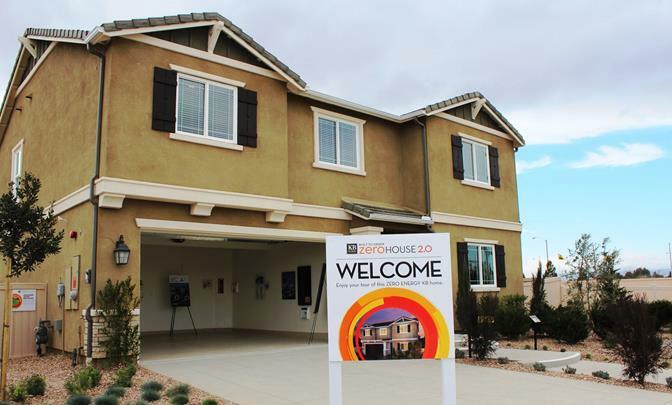 LANCASTER – KB Home on Wednesday unveiled its first ZeroHouse 2.0 during a special event at the builder’s Dawn Creek community in Lancaster. It’s the first KB home designed to achieve both net-zero energy status, and zero freshwater irrigation use by a family of four or more. Dubbed the “Double ZeroHouse” for its dual emphasis on energy and water efficiency, the home is equipped to recycle drainwater on-site and reuse it for landscaping, minimizing the home’s overall demand for new water and eliminating the household’s need to use freshwater for the home’s established low-water landscaping. KB Home estimates that the Double ZeroHouse 2.0 at Dawn Creek can conserve 150,000 gallons of water each year when compared to a typical resale home and landscaping, a reduction of approximately 70%. In addition, the ZeroHouse is designed to produce as much energy as it consumes, potentially yielding an electric bill of $0. The first-of-its-kind KB home features an advanced water recycling system, a water recycling dishwasher, a “greywater” heat recovery system, super-efficient air ventilation and purification systems as well as a “fuel forward” garage with both an EV charger for electric and hybrid vehicles and a CNG fueling station for natural gas powered cars. The home’s water recycling system treats greywater from bathroom showers, tubs, sinks, and washing machines to near-potable quality, and reuses it on the landscape. KB Home’s ZeroHouse 2.0 at Dawn Creek is the builder’s first to showcase this technology that, according to manufacturer’s estimates, can help a family of four recycle up to 40,000 gallons of water annually. “With drought conditions currently affecting every corner of California, KB Home recognizes the importance of embracing innovations like the advanced greywater recycling system demonstrated in this ZeroHouse 2.0 that leverage the technology of the future to address the problems of today,” stated Tom DiPrima, executive vice president of KB Home’s Southern California division. Water-recycling technology is also featured in the home’s dishwasher, which uses 33% less water than other dishwashers by saving water from the last rinse cycle for use in the first pre-rinse cycle of the next load. The home’s greywater heat recovery system extracts energy from drainwater and uses it to preheat water in the home’s tankless water heater, further reducing water heating costs. The ZeroHouse is connected to real-time water and energy monitoring systems that can track the water and energy used by the house from smart phones and tablets. Home automation technology included in the home puts the power to control its lighting, thermostat and security functions at its owners’ fingertips, and the home’s ‘smart’ refrigerator further reduces the home’s demand for energy by shifting energy-intensive functions to off-peak times. Mayor Parris presented KB Home’s Tom DiPrima with a key to the city in Wednesday in recognition of DiPrima’s role in developing the partnership between KB Home and Lancaster. KB Home’s ‘Double ZeroHouse 2.0’ at Dawn Creek is now open in Lancaster. For more information, visit www.kbhome.com or call 888-KB-HOMES. 15 comments for "KB Home unveils “Double ZeroHouse”"
Funny, building energy efficient homes so far out of town that residents have to use fossil burning cars always, every day, all the time in order to do anything. Kind of a contradiction, in my eyes. After you’re here a while longer, you’ll notice that almost everything Rex Parris does is either questionable on its face or causes problems for someone. It’s been one thing after another after another. Elected officials have to make tough choices all the time but Rex Parris seems to go out of his way to be a thorn in someone’s, anyone’s side. I’m sure you’ve met people like that in life, maybe an acquaintance, relative, co-worker, neighbor, etc. But, when such a person is a mayor of a fairly good sized city, he can do a lot a damage. Are you familiar with Gov. Chris Christie’s troubles in New Jersey? Parris is a smaller version of that kind of bullying, arrogance and retribution. You must know how attorneys can manipulate and play with the legal system to their advantage. We’ve watched Parris do that proudly and publicly for years now. Too bad they don’t build them in Quartz Hill! WHY WOULD YOU WANT TO ADD 44 GRAND TO THE COST OF YOUR HOUSE? YOU WILL ENDED UP PAYING MORE PROPERTY TAXES BECAUSE THE ASSESSED VALUE IS HIGHER AND MORE IN INTEREST ON YOUR LOAN. IT TAKES MORE THAN 10 YEARS TO RECOUP THE COSTS AND BY THEN YOU WILL END UP REPLACING THE EQUIPMENT. BESIDES YOU ARE ALREADY PAYING FOR YOUR SEWER WATER TO BE TREATED NOW. YOU WILL SAVE A LOT MORE PUTTING IN YOUR OWN XERISCAPE. THIS IS A “NICE” IDEA BUT IMPRACTICAL. Lancaster is now REQUIRED to have every new home built with solar. IMO this will make home buying even more expensive than it already is. More regulations. Sigh. And this is something Republican Parris did? Sounds more like something our California super majority Democrats would do. Plus,, KB is sorta the McDonald’s of homes. Look at those shallow eaves and the garage built into the house like it’s a condo. KB knows how to skimp. Maybe they are more like the Walmart of homes. KB can probably get materials cheaper from vendors like Walmart and then you get a cheap home. Their floorplans are weird if not downright awful. I’ve been in dozens of KB homes over the years and I even saw one with woodgrain contact paper covering the kitchen cabinets back in the 90s in a model. I bet you can’t even get a full size car in the garage. Rex likes Walmarts and KB homes. Coincidence? I wonder what KB will skimp on in order to make the solar homes more affordable. We should know by now that the biggest builder isn’t always the best. Nor, the lawyer with the billion dollar settlement total isn’t necessarily the best. Whoa, greed looking at the panoramic view of the antelope valley. money,money. remember the gold rushes of the past. gold,gold. Sadly most new houses will never be like the houses they were, I own a KB home for the most part it is built well, they just rush through them and not much detail is put in on some aspects. Not enough mud on joists and nails for the drywall not countersunk enough. I am an original owner and the minor things I can fix but when i did my walk through from start to finish I pointed things out if I felt it was out of place. Governor Brown inherited a big debt from the previous republican governor and we now have a surplus. Kinda like President Obama inherited a huge mess from a republican who in turn inherited a surplus from President Clinton. Republican Rex had his city’s bond rating lowered while in office. in conservative Lancaster. So much for conservatives managing government. Democrat Assembyman Steve Fox has done more for this district in a year than the Runner’s and Steve Knight (all Rs) have done in decades of being in office. Nearly all the recessions in the last 60 years have been during republican administrations. How ’bout that? Who needs regulations anyway, not West Virginia, not North Carolina nor any other red state that’s had catastrophic man-made disasters such as toxic chemicals from coal mining polluting drinking water for thousands. Yet, many of those same states have REGULATIONS on women’s health and reproductive rights that limit them. As annoying as republicans are out of office whining and complaining, they are even WORSE in office unable to govern. Apparently, Gov. Chris Christie was clueless about all the corruption going on just outside his office door. At least President Clinton ran the country pretty good even though he was a ‘lover boy’ behind closed doors which drove the republicans stark raving mad. They are still mad. There is no surplus in this state no matter how you spin it. Who is to blame for that? Politicians, plain and simple. It has been reported that there is a surplus. By your logic, previous reports of a multi-billion dollar debt were also spin. Can’t have it both ways. Very true. It takes the decision making power away from the people and forces them to buy something that is much tooo expensive. I looked at solar myself, and the costs are to high, but it is a decision I can still make on my own. If the Council mandates for every homeowner to follow, residents do not have money laying around. Looks like the only free trade and fiscal conservatives running for council in Lancaster are Ervin and Mejia. The Parris Team of Crist and Smith spend taxpayers money with reckless abandon (BLVD, Eye in Sky, Beer Fests, unneeded roundabouts), bring unwanted commerce to places the people don’t want it (Walmart in Quartz Hill) and have taken our once proud bond ratings to junk bond status. Image what they will do if given another term!